Appleton Estate White Jamaican White Mixing Rum is a popular Rum available from DrinkSupermarket.com in 70cl to buy online. Visit DrinkSupermarket.com for the best price for 70cl of Appleton Estate White Jamaican White Mixing Rum or compare prices on our other Rum products. 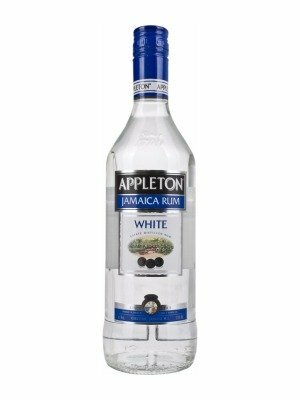 Appleton White Jamaica Rum is a blend of rich pot and light column still rums and, unlike many other white rums, it is filtered slowly through special charcoal filters. Appleton White is a light-bodied rum that is brilliantly clear and exceptionally smooth. Appleton White Jamaica Rum is highly mixable and serves as the perfect complement to soft drinks, fruit juices and exotic punches. Anything gin and vodka can do, Appleton White can do better. Where to buy Appleton Estate White Jamaican White Mixing Rum ? Appleton Estate White Jamaican White Mixing Rum Supermarkets & Stockists. You can buy Appleton Estate White Jamaican White Mixing Rum online in most retailers and find it in the Rum aisle in supermarkets but we found the best deals online for Appleton Estate White Jamaican White Mixing Rum in DrinkSupermarket.com, TheDrinkShop, and others. Compare the current price of Appleton Estate White Jamaican White Mixing Rum in 70cl size in the table of offers below. Simply click on the button to order Appleton Estate White Jamaican White Mixing Rum online now.